We had some pretty serious rain this past Saturday (well, serious for So. California!). I love when it rains here, everything gets all nice and clean. Plus, my plants and grass get watered~ for FREE! I was volunteering at our local AYSO Soccer sign-ups during the rain burst. People were coming in pretty wet along with their paper work. One poor parent came in with a completely drenched check. I told him it was not a big deal because we could just pop it into the microwave to dry. Are you giving me the same look 5 other people in the room gave me when I said that? You would have thought I had 3 heads! I discovered this little tip years ago. Not really sure how and why. Probably out of desperation because one of the kids “masterpieces” got soaked by a spilled drink. Baby Girl was not exactly known for her “even temperament” back in those days! I needed to come up with a solution and STAT! 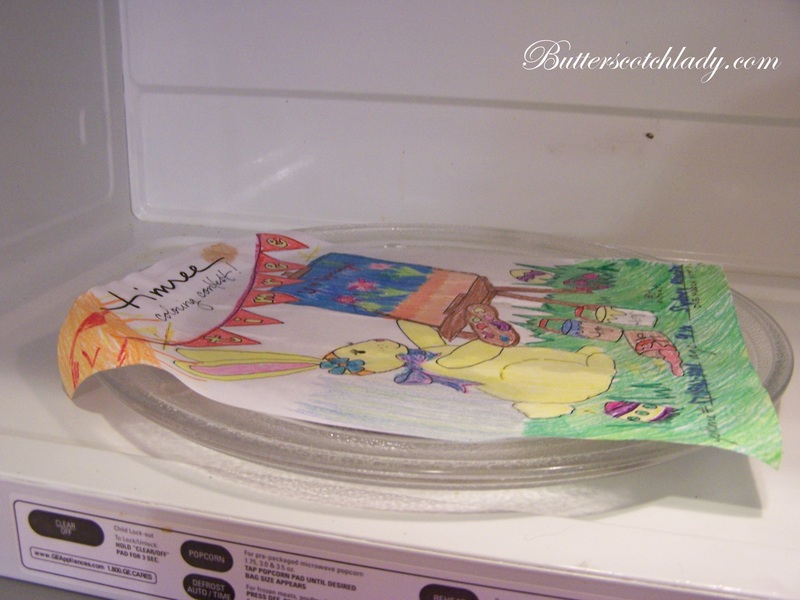 Put the soaking paper into the microwave and set the time for 30 seconds at a time until the paper is dry. It took approx. 1:15 for this soaking sheet to be completely dry. The paper may curl up just a bit, especially at the corners. If you (or the freaking-out upset child, REALLY needs it to be perfect, you can iron it very quickly). I hope this helps you out. I know that this trick has saved me several times from a very upset child! Have you ever found yourself in this position when planning a brunch, luncheon or dinner party? 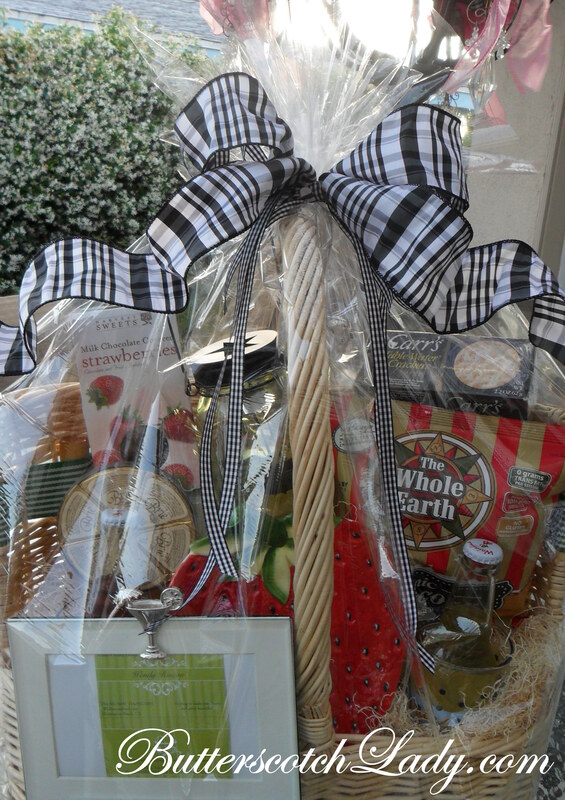 You have your guest list organized, menu planned, beverages and bar laid out, dessert has been made (ordered? Hey, I don’t EVER judge! ), you are (finally) using your wedding china for the first time in ages, Grandma’s silver is polished and shiny. Ok, now what to do? Centerpieces for the table! I used to always stress about what to do for a centerpiece. I just never seemed to have the “right” supplies to make an amazing piece. And usually, my budget was blown on the food and drinks. I remember several years ago I was having a small dinner for my Mom’s birthday and I had no ideas and no money for a centerpiece. So I wandered around my house, )ok we all know that only took about 10 steps!) to see what I could use. My hallway heading to the bedrooms is filled with family pictures and that gave me an idea. I had several pictures of my Mom as a little girl, so I took them off of the wall and them on the table using mini easels I have. Voila! A unique, FREE centerpiece that was also a conversation starter. But the best part for me? It celebrated my Mom! My great, great-grandmother (on the left) and her sister. My great-aunt and uncle collecting eggs and my great-aunt all “dolled” up to hit the town. Picture of my great-grandmother having a tea party with my grandma Evelyn and my great-aunt. 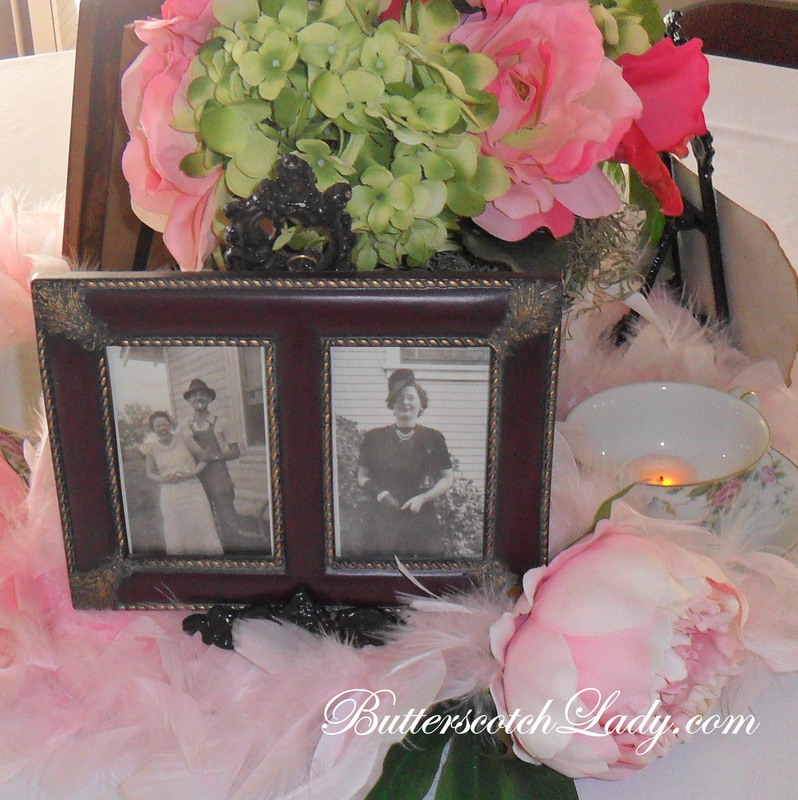 The centerpiece pictured above was created using supplies I had around the house. Do you recognize the silk flowers? 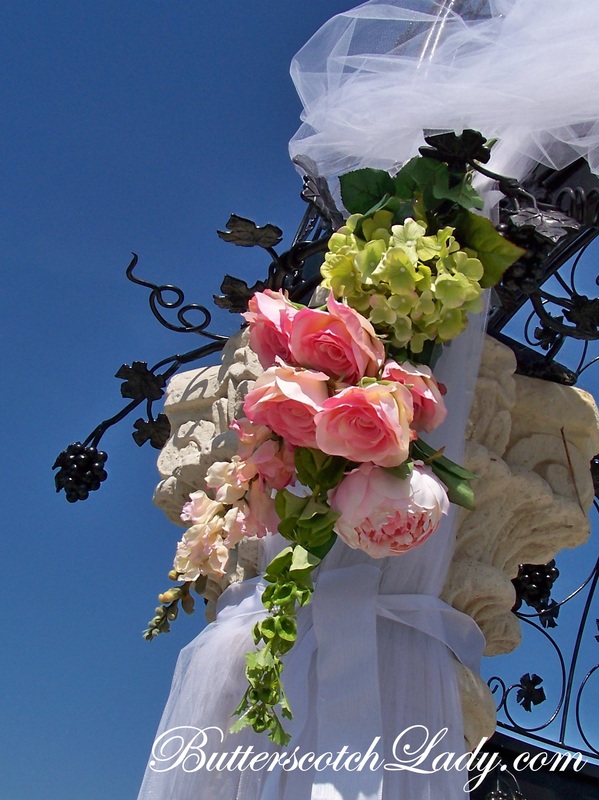 These were used on the gazebos for the wedding I wrote about a couple of weeks ago. This is one reason why I love to use artificial flowers. You have a one time expense and then never again! For me, creating a unique and beautiful arrangement is all about layering elements and textures with different heights. One of the tea cups was my great grandmothers, the other a gift from a friend, the boa was Baby Girl’s, the easels were $3 each years ago at Michael’s (I sprayed them black), the “silver” bowl (not silver!) $3.95, vintage and antique pictures from my family~free. 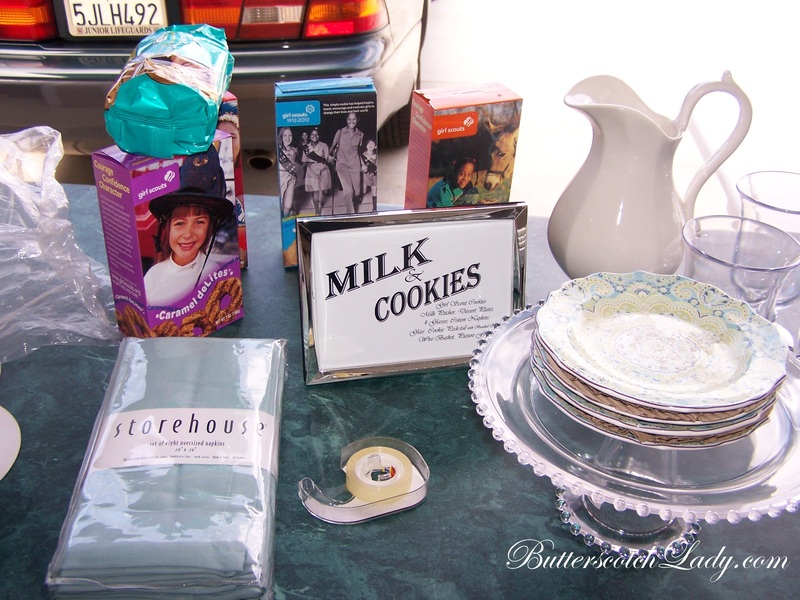 The next time you are entertaining don’t stress about spending a lot of money (or time) on a centerpiece. Look around your house and use what you have! Last week I met with Krista, owner of “Dolly’s Sweet Dreams Cotton Candy“. How ADORABLE is that cotton cart?!?!?!? I have always loved cotton candy, not only because it is “sweet”, but because it is so darn pretty! But Dolly’s Sweet Dreams Cotton Candy is not just your “run of the mill” fair fare, nope! 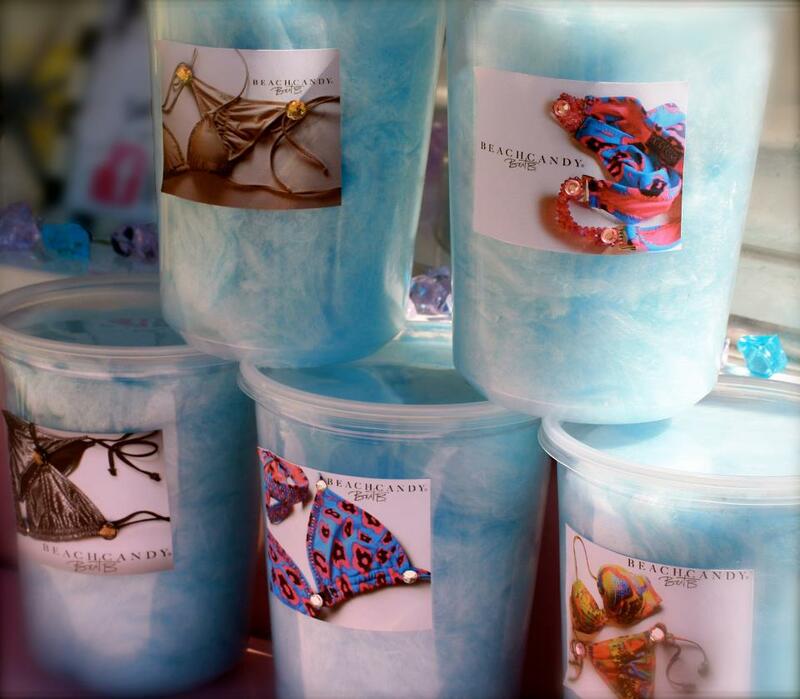 Their cotton candy comes in different flavors and colors. I got to try the green apple and raspberry. O.M.G.! It was light, airy and delicious. 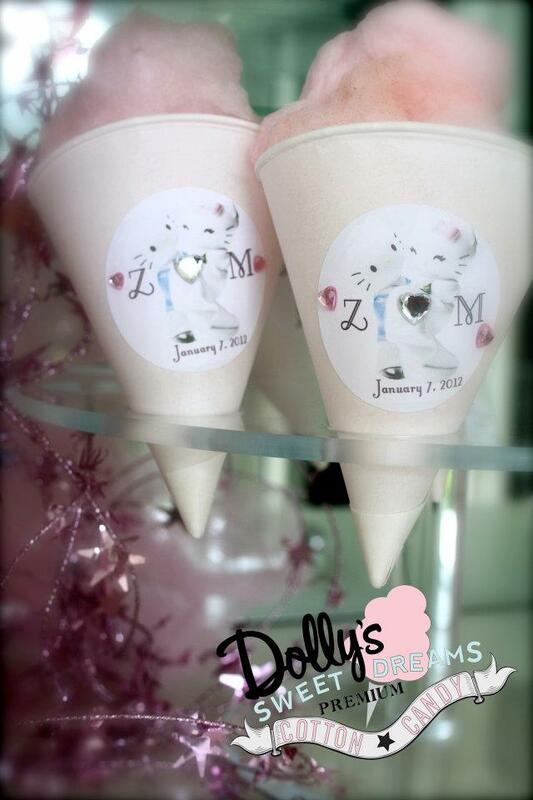 Dolly’s Sweet Dreams Cotton Candy can customize the sticks to coordinate for your party or event. And you just know I LOVED that! How about instead of sticks, cone cups with Bling! You can also have Dolly’s pre-package the cotton candy flavor of your choice into tubs with a custom logo (orders over 50) for your next party or event. I am ordering pre-packaged Green Apple 8 oz. tubs (tubs are 8 oz., 16 oz., or 32 oz.) with our school logo to give away at our school tour next week. It is the perfect color for our school~GREEN! 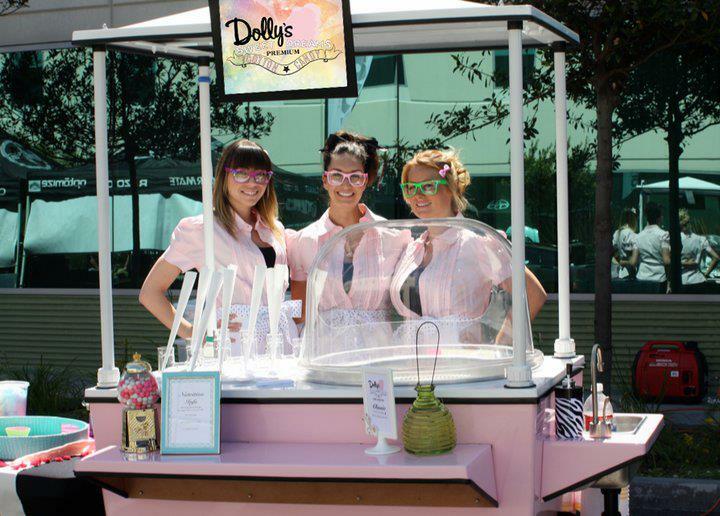 Dolly’s will also be at our school Carnival Friday, June 1st. 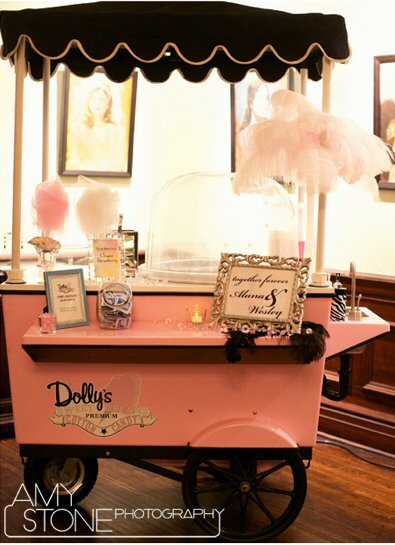 If you have Dolly’s Sweet Dreams Cotton Candy cart at your next event, she can even rim your martini (margarita…) glasses with cotton candy! How SWEET is that? I can not wait to have a “Girl’s Night” with Martini’s! 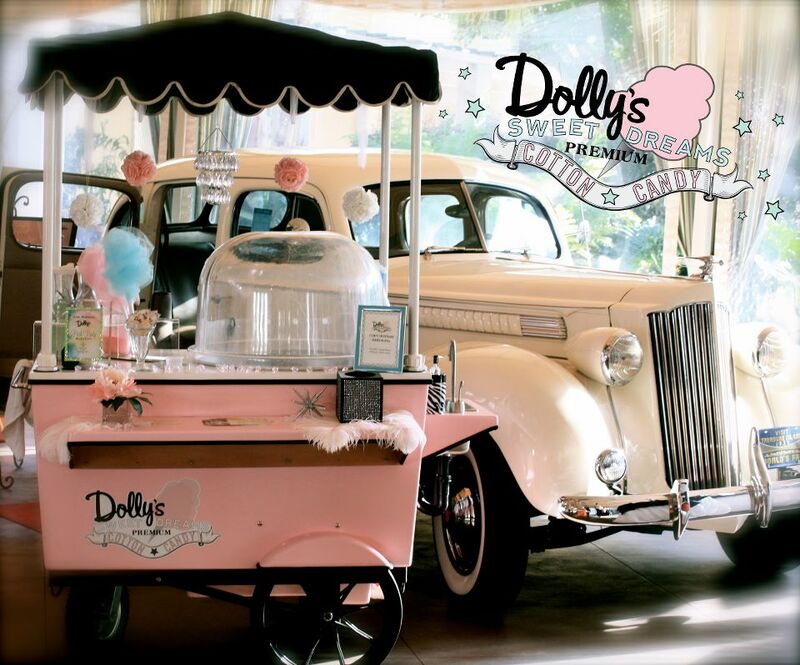 Dolly’s Sweet Dreams Cotton Candy at your next event! PS. I need to ask if BUTTERSCOTCH cotton candy is available!!!! 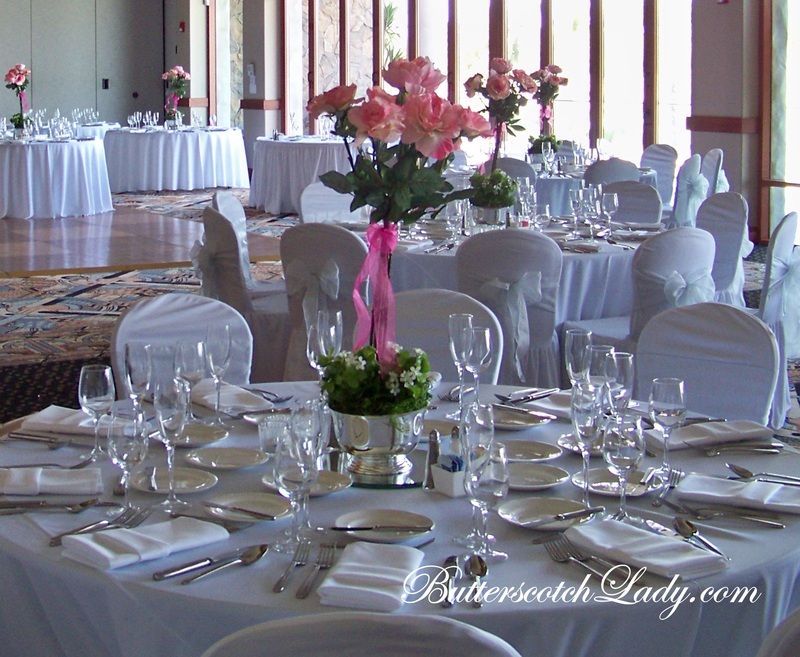 Last March, I had the honor of decorating for a dear friend’s wedding at “Old Ranch Country Club” in Seal Beach, CA. 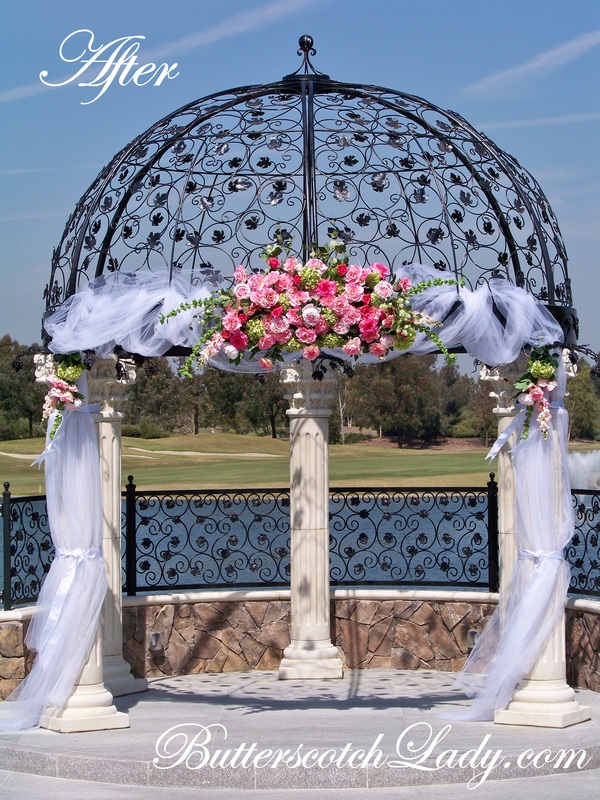 The ceremony was outside underneath this beautiful gazebo. 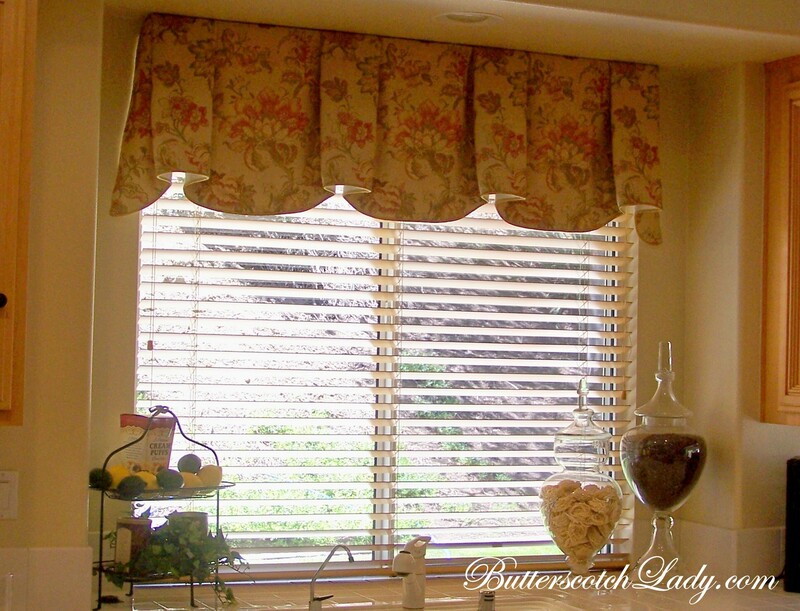 It is not too difficult to make something that looks this beautiful into something FABULOUS! Inside the reception. 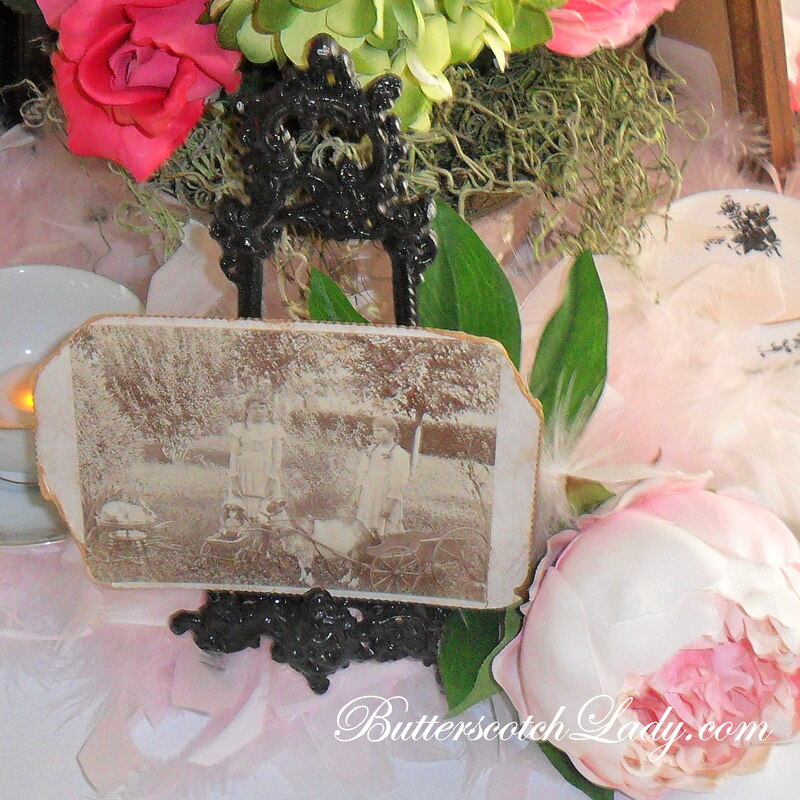 I also created the rose topiary trees for the center pieces. Simple, yet elegant! 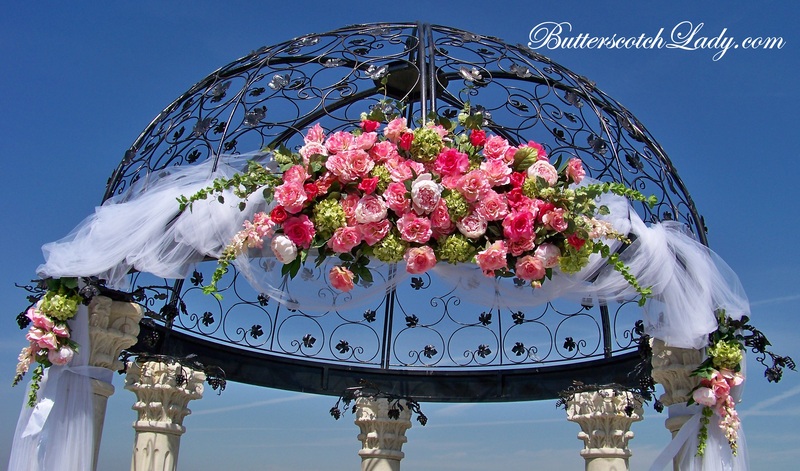 The gazebo’s flowers were removed and set up at the Bride and Groom’s Sweetheart table. Unfortunately, I do not have pictures of the table (I am going to have to track some down!). The flowers are not real! The bride was very conscious of her budget and we wanted a “big budget” look but without spending “big money”. Now, I know some people may turn their noses up the at the revelation that I used silk. (You shouldn’t!!!) Honestly, no one could tell at the wedding. Could you tell from the pictures? And let’s be honest, after a wedding all you have left are the pictures! 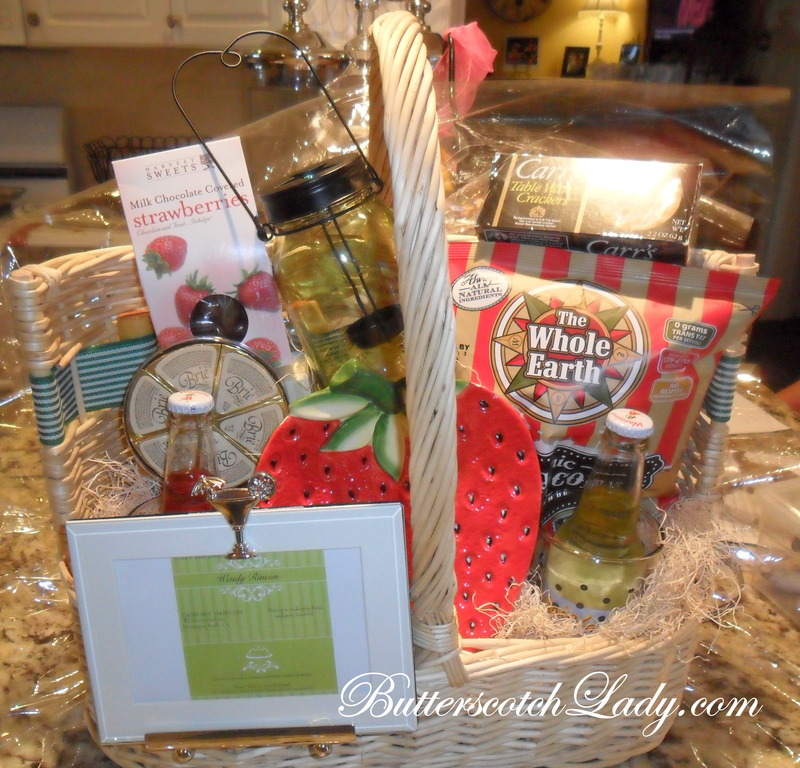 I had guests ask me how I was able to assemble everything and have it stay so fresh! I know you have heard me say that the fantastic weddings and parties that I drool over on Pinterest ALWAYS make me ask, “What in the world was their budget?!? !” So are you wondering how much was spent on this wedding’s flowers? Well, I will not divulge the exact amount (most brides want you to think they had an unlimited budget! ), however, I can tell you we purchased the flowers for less than $400!!! It was such a special day for me to be a part of. Nothing makes me happier than being able to create a beautiful day for a Bride and Groom! And as guests, Mr. Cabana and I had a great time with dear family friends and family celebrating a long-awaited event!!! Happy 1st Anniversary Erin and Jeff!!! Wow, we are having another glorious winter day here in Southern California. Temps in the mid 70’s today. 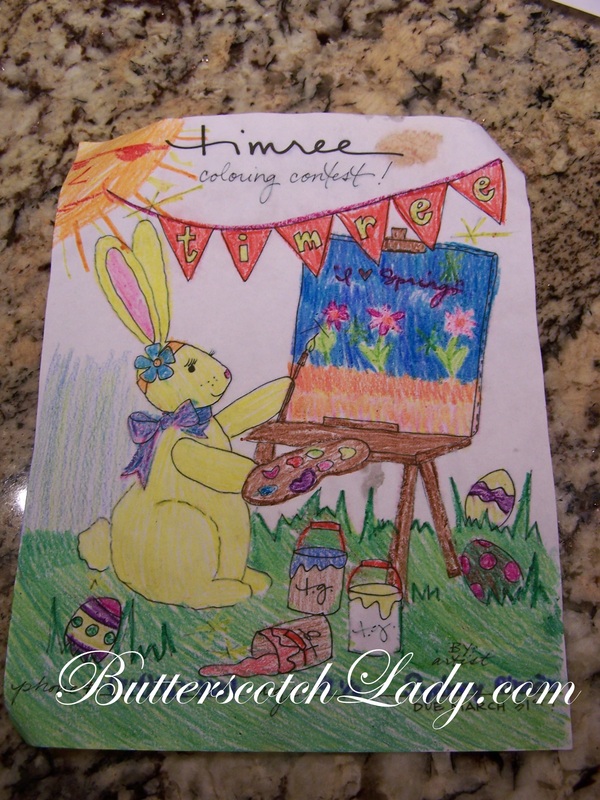 Ahhh, I am starting to feel Spring just around the corner! 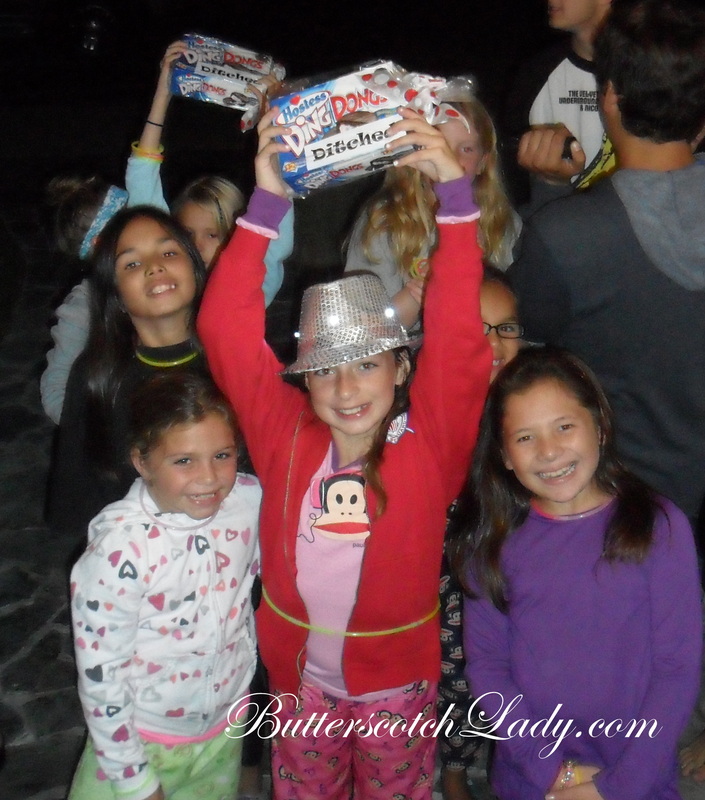 I thought I would share a bit of Baby Girl’s 9th Birthday party. If you have learned anything about me, it is that I LOVE to throw a party. But also that i do not believe you need to spend hundreds (thousands!) of dollars to have a great looking party. 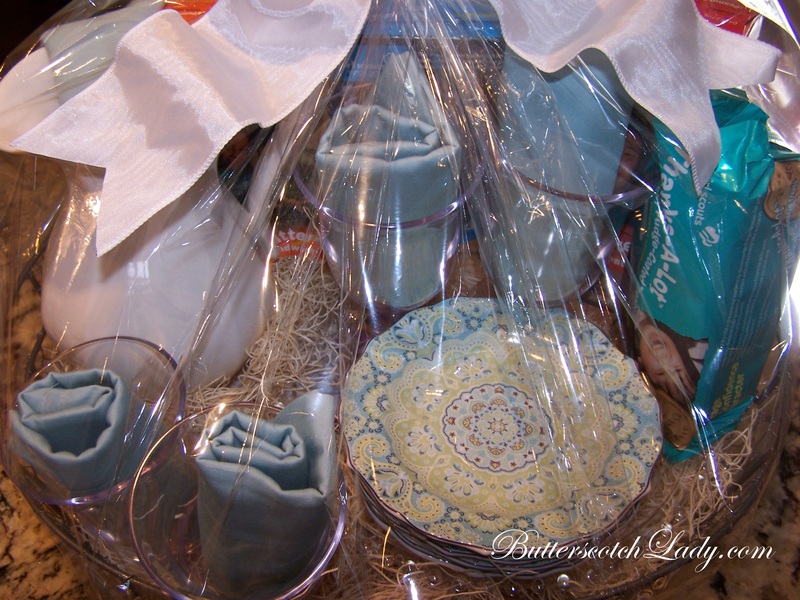 Trust me, when it comes to kids, do you really think they care that you paid $5 per cupcake or $100 for the cake? If you have an unlimited budget, awesome! Call me and I will plan an EXTRAVAGANZA for you! But for the rest of us, it is about using what you already have, borrowing what you don’t and purchasing inexpensive items that can be “dressed up” to look more fabulous. One of Baby Girl’s birthday gifts pulled double duty~ A large canvas (gift) on a vintage easel (gift) with a sign welcoming the party guests. I always have a sign, picture, wreath… at the door signal that we are having a party. I like making guests to feel welcome from the moment they come through our front gate. Nothing makes a party like personalizing the decorations. 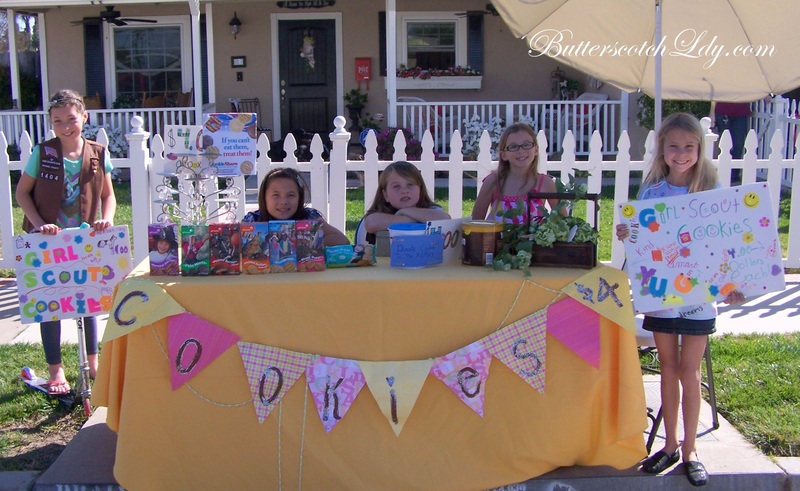 Bunting and banners are always a popular and inexpensive go-to party decoration. Until I have the budget to purchase a Cricut (a machine that cuts shapes, letters…), I think hand-painting the bunting works just as well. And who doesn’t love to paint? I added sparkly buttons to dress it up. The banner cost around $5 to make. And you thought a feather boa was just for dress up! 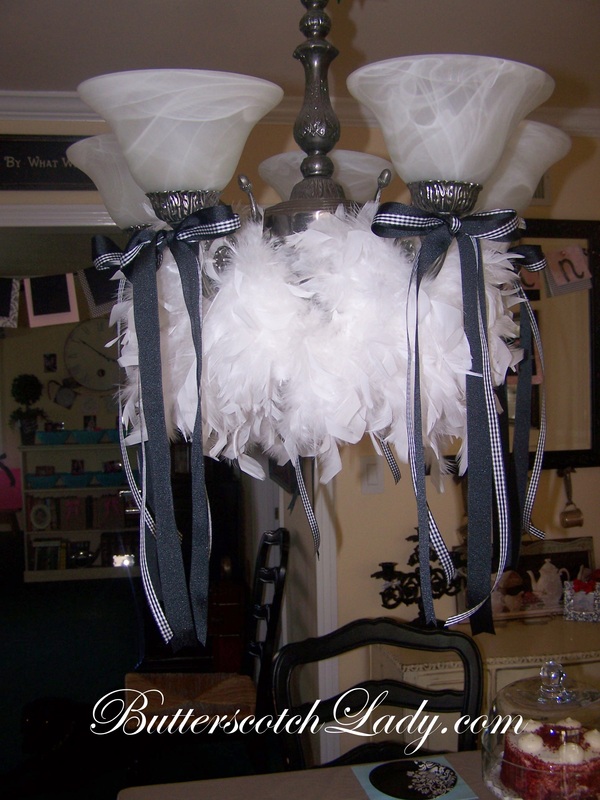 Well, here is another use for a boa~ Dress up your chandelier. Behind the curtains panels is my bedroom window. I found these panels at Ikea in a 2 pack for $19. The frame came from Ikea as well. A family friend has a banner shop and he did the vinyl for me. Each party guest had a bucket with their name for water, napkin and utensils. I found them at Ikea for $1 each. Baby Girl LOVES straws and don’t they look adorable in the mason jars? Yes, you have seen me use them before (Valentine Cupcake and Hot Chocolate party). It is an easy go to for any party! When planning a party, I always come up with a color scheme and use those colors over and over; from the invitation (I need to make another one from this party because they were SO DARN cute! But of course we gave them out and forgot to keep one! Ugh! 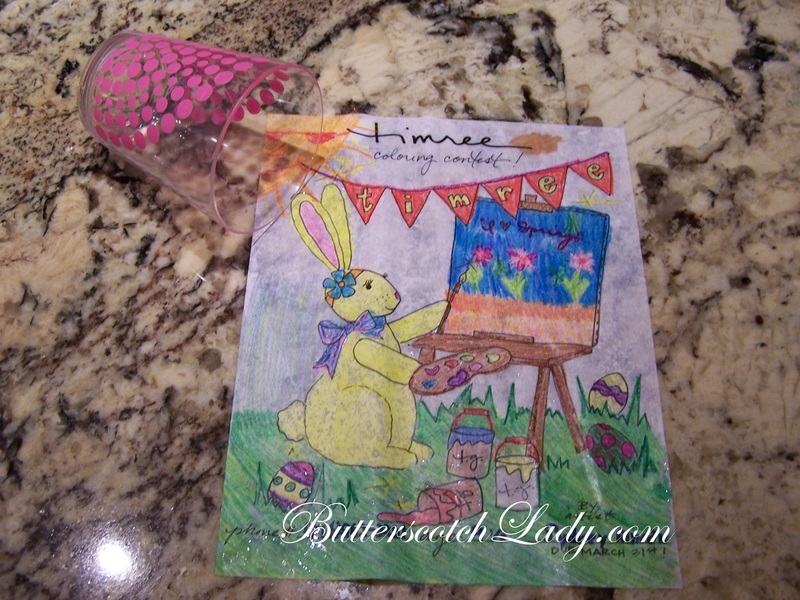 ), to bunting, plates, napkins and candy. I bought the taffy, watermelon balls and white malt balls in bulk (approx. $20), the labels on the jars were made from leftover paper from the invitations. I found this idea on Pinterest and just knew the girls would go crazy for it! And they did. And so did the teenage boys! I think Buddy and his friends had as much as the girls leaving the treats and hiding. I have to admit, playing ding-dong ditch and hanging around to watch the door open was very funny! The party revelers~They had to have their picture taken at my friend’s house that was our first Ding Dong victim! I think a new tradition was born that night! Having a party soon? Contact me and I can help with styling your event!